I read this article and found it very interesting, thought it might be something for you. The article is called In A Sylvan Valley, One Woman Reveals, Changes Lives Obscured By Beauty and is located at https://archive.indiaspend.com/special-reports/in-a-sylvan-valley-one-woman-reveals-changes-lives-obscured-by-beauty-88932. 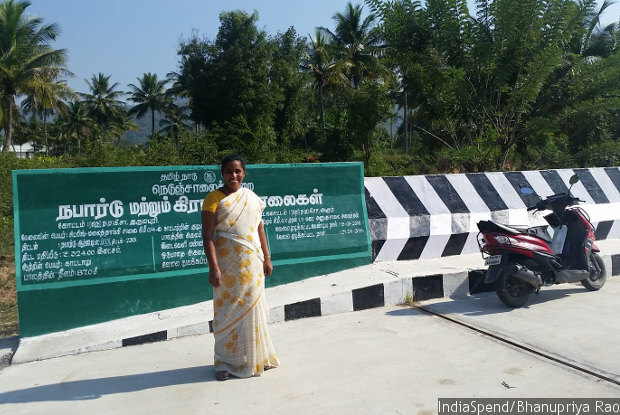 As panchayat president for Sittilinghi in Dharmapuri district, 39-year-old Tenmozhi built a Rs 30-crore bridge (in photograph), health centre, battled child marriage and now lobbies for a higher-secondary school that will allow girls an alternative to marrying early. Sittilinghi, Dharmapuri district (Tamil Nadu): Nestled in a sylvan valley in northwestern Tamil Nadu and surrounded by forests, the village council, or panchayat, of Sittilinghi struggled to bring to state attention the infirmities obscured by its natural beauty. There were few roads between the 40 villages governed by the panchayat. There was no health centre. There weren’t enough schools–so girls dropped out and married before 18. That began to change in 2011 when a soft-spoken, mathematics graduate and former hospital administrator was elected panchayat president in a seat that was not then reserved for women. In the five years since, Tenmozhi (she uses one name) has had a Rs 30-crore bridge built to link seven remote villages, a public health centre (PHC) sanctioned, battled early marriage and now hopes to build a secondary school, so families allow girls to study instead of getting them married. Tenmozhi is one of 40 past and current women panchayat leaders we surveyed across six Tamil Nadu districts to analyse the impact of a quarter century of reservations for women in local bodies. We found a majority of women now work independently of the men in their lives and, despite a series of hurdles that denies them access to finances, such as male-dominated political networks and limited powers, they have carved out distinct identities for themselves and overtaken men in building roads, providing drinking water and toilets, as the first part of this series explained. Overall, Tamil Nadu now has India’s lowest fertility rate–lower than Australia, Finland and Belgium–second best infant mortality and maternal mortality rate, and records among the lowest crime rates against women and children, as IndiaSpend reported in December 2016, but parts of the state report third-world indicators, such as Sittilinghi. The 8,246 people spread across 40 villages are largely from a Malayali tribe, who make up 76.4% (Census 2011) of the panchayat’s population. The literacy rate is 68.5% in Dharamapuri, the lowest in Tamil Nadu, and the same as Uttar Pradesh; the female literacy rate is 60%, which is the same as Madhya Pradesh, according to Census 2011 data. Most of these problems appear linked to one problem: Access. One of her first tasks was to connect these seven villages through a bridge over the Kattaru river that runs through the valley. Since panchayats do not have funding for large infrastructure projects, they must rely on state funding, which, often, requires years of lobbying. For instance, the process of building the bridge began with repeated petitions to the district administration. In 2012, when Tenmozhi went to Delhi to attend a meeting of women sarpanches, she visited the union tribal welfare department and petitioned them too. “It took two years, but we finally got the sanction for the bridge in 2014,” said Tenmozhi. Funded by the National Bank for Agriculture and Rural Development (NABARD), the bridge cost Rs 30 crore and was opened to public use in January 2016. She struggled similarly to get the village PHC. The panchayat had a sub centre, manned by a village health nurse (VHN), who was mostly absent, said Tenmozhi. The region struggles with health infrastructure. There are 218 sub centres, but most lack staff or infrastructure. The PHC nearest Sittilinghi village is 11 km away, at a village called Kottapatti. For more remote and inaccessible villages, the journey stretches to 30 km. Even so, Kottapatti’s PHC has not had a resident doctor for the last five years or so, said Lalitha Regi, a doctor and founder of the Tribal Health Initiative, a nonprofit that provides some public health to the valley. It is here that Tenmozhi was a health administrator before her plunge into politics. Nearly 14% of all Dharmapuri district villages do not have a PHC within a 10-km radius, according to data from District Level Household Survey 2012-13 (DLHS-4). Tenmozhi’s lobbying was successful in getting a PHC sanctioned for the panchayat. The PHC operates out of a rented building, while a new building is constructed. Access to education is another big challenge in the region, especially higher education, which forces young girls into early marriage. Sittilinghi panchayat’s 40 villages are served by nine elementary schools, two middle and three high schools. There is no higher secondary school. For students, these schools are, often, hard to reach. The village of Karappady, for instance, has no drinking water or electricity because the forest department has not allowed roads to transport infrastructure. The only way to reach the village is to walk or hitch a ride on a motorcycle. Karapaddy has an elementary school. Middle-schoolers must either walk 13 km each way or be ferried on motorbikes to Harur, headquarters of the block. Predictably, girls drop out early, doomed to early marriage. In 2011, Dharmapuri district had 3,914 girls below the age of 18 who were ever married (including divorced, widowed and separated)–according to Census data here and here–more than 20 of Tamil Nadu’s 32 districts. Tenmozhi’s struggle in getting a secondary school illustrates the limited power of panchayats. Unlike Kerala or Rajasthan, where the devolution index allows panchayats control over local education and health, schools in Tamil Nadu are controlled by the state education department, as health institutions are by the health department. The rules of the Tamil Nadu School Education Department say the demand to expand a school or add higher grades must come from the head teacher of an existing school. The Monday journey to the Collectorate and the journey back takes all day. She returns late in the evening, but she knows the only hope of success is to be constantly seen in the government’s offices. “If the government is serious about ending child marriages, then it should look at education reaching the remotest parts, such as ours,” said Tenmozhi. While she hopes and waits for the higher-secondary school, Tenmozhi runs a campaign against child marriages, reporting them when one comes to her notice or creating awareness. Two years ago, she reported 10 potential child marriages to block officials. She monitors applications to the state government’s marriage and education schemes, such as the Moovalur Ramamirtham Ninaivu Marriage Assistance Scheme, to check if any applicants are under age. The scheme run by the Tamil Nadu State government provides monetary marriage assistance to women above 18 years of age who have studied upto 10th grade (fifth grade for Scheduled Tribe girls). “The awareness programs have worked to a large extent,” said Tenmozhi. For two years, she has not heard of a child marriage in sylvan Sittilinghi. But, if this trend is to stay, she must have that higher-secondary school. This is the third of a four-part series. You can read the first part here, the second part here and the fourth part here. She should have a car or a jeep (because of the rugged terrain). If she could mobilise Rs 30 crore for a bridge, can’t she keep one or even two vehicles? Her time will be saved and she can do more. Let the government gift her a jeep or van immediately.